Aaron and I have been working on something that I'm really excited about. We have started a new blog together! AaronSaysJennySays is a blog where we will simultaneously post about recipes, restaurants, music, movies, products and eventually home improvement projects. We write each of our posts without seeing what the other wrote. We don't always agree but the funny thing is there is usually something the same - we both used the phrase "Chop Chop Fire Fire" in our Sunrise Grill review and described the album Relator as "toe-tapping". 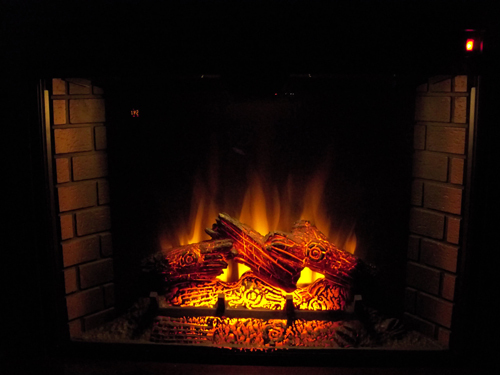 So AaronSaysJennySays is a work in progress but we have few posts over there already like what Aaron thinks about our new electric fireplace and what I think about our new electric fireplace. There will be lot's more to come! oooh, this sounds so fun! My husband and I sometimes write about the same things, but he always does it the same day it happened, and it takes me a few days to catch up. You guys are too cute!! Love it! I tried commenting on aaronsaysjennysays but for whatever reason I couldn't. ugh. anyways... I bought the Break Up CD based on both of your reviews and I absolutely LOVE IT! thanks guys!! !